So here we are: This is it. I should have asked earlier; do you want an epigraph? Only one? Those last two sound familiar: There are only so many that work that well for a Super Bowl. Are you at least excited for this one? Obviously. But two weeks is still too long. This game needs to be played the week after the championship games. But a week’s too short! Play the game on Wednesday! How much of that position is based on Rob Gronkowski’s improving health? Roughly 25 percent. The other 75? I know when it’s crammed into one week, it complicates things for the host city and for all the media responsibilities. But honestly, do we need Super Bowl Media Day? What good comes of that except journalists mocking (and in some cases simultaneously ogling) less professional journalists? I appreciate that the added time means added space in the newspaper for better features, but as a fan, do we really need life stories for each member of the 53-man roster? Eight of those guys don’t even play. So you want to eliminate Super Bowl Media Day? I want to make it worthwhile. I guess from my perspective that comes down to limiting the access of outlets that go there simply to ask ludicrous questions. There has to be a better filtering process. Hop on that censorship bandwagon, you fascist: There’s a filtering process in terms of credentials for every practice, every game. And then everybody gets into Super Bowl Media Day, it seems. Weird. Did you want the Ravens or Patriots? In so much as I thought ahead before the Giants-Niners game, I preferred the Ravens. The Giants would have a better shot to beat Baltimore, I think. But then we’d miss out on The Rematch Bowl! I disagree with so much of that premise. That game was four years ago, and there’s a rebuttal to almost every similarity Peter King throws out there. Sure, 23 players are back…out of 90. He has to write that the left tackles are both back because it wouldn’t help his point to mention that only half of the offensive linemen in the game are the same. And saying that “all” the key defensive linemen are back is perhaps the most insulting thing anyone’s ever done to Michael Strahan. There is not a single linebacker in this game who played in the last one. Wes Welker is the only wide receiver. Two totally different teams then! I didn’t say that. Obviously there are more similarities than in just about any Super Bowl. But that game was played February 3, 2008, not last week. Do you want to criticize Peter King for anything else? His prediction column is just about 1500 words, and he devotes one-third of them to the Hall of Fame conversation, which is like spending one-third of a column on Barry Bonds’ Hall of Fame candidacy by debating the numbers. It is, at this point, irrelevant. It also includes sentences such as “This is my prediction column” and “That’s a boring, predictable analysis.” Sometimes he writes like a nine-year-old. Or a law student. Take that, Josh! Josh is already working on his rebuttal. Anything else? Peter King’s against Roman numerals! A lot of people are against the Roman numerals: A lot of people like McDonald’s too. Anyone who doesn’t get the Roman numerals doesn’t get branding. The Super Bowl isn’t what it is today without the Roman numerals. I don’t buy that for a second: It’s about self-mythologizing. The Roman numerals play into that NFL Films gladiatorial aesthetic. They class up and historicize any event. I’m finally ready to get into the trenches here: You sound like Sebastian Vollmer! For once, I do want to discuss strategy—those so-called X’s and O’s—because this is such an intriguing matchup. I hope you don’t mind me going into an extensive, point-by-point breakdown of the most important elements of the game. 1. How does each team defend the middle of the field? It wasn’t until this season that I developed a real sense of the significance of the slot receiver. I just kind of thought anyone could go there, and that playing the slot (and defending against it) was no different than being split out wide. But slot receivers run even more option routes than the guys wide, and they really need to be on the same page as the quarterback in choosing which route to run. Brady and Welker have done this for years; it’s been a lot of fun to see Manning and Cruz develop that chemistry (and very quickly) this season. It’s so much harder to defend in the slot not just because of the option routes that exploit your coverage, but also because you’re missing the extra defender of the sideline. Nnamdi Asomugha can shut any receiver down on the perimeter, but he was burned by Cruz in the slot in Victor’s Week Three coming-out party. So, to try answering the question: The Giants will use their versatile defensive backs—namely, their safeties—to try to combat Welker (and Gronkowski and Hernandez) in the middle of the field. In the first matchup, Antrel Rolle spent much of the game on Welker, and even though Wes went off for nine catches and 136 yards, that’s probably New York’s best option defensively. Rolle was drafted as a corner, and he’s about as good as safeties go in that responsibility. Deon Grant, who usually comes onto the field in nickel packages, will probably be responsible for one of the tight ends inside (Gronkowski I’d suspect, since he comes off the line of scrimmage way more than Hernandez. This may be complicated by something we’ll get into below). For New England, I’m guessing it comes down to bracket coverage of Cruz, which will open up the perimeter for Nicks and Manningham. The Pats don’t have anyone who can stick with Cruz on any kind of consistent basis—he beat Kyle Arrington a number of times in Week 9, and Arrington’s New England’s best cover corner in the nickel. If the Patriots plan on putting Julian Edelman on Cruz as they did on Anquan Boldin, well, good luck. New York’s confidence regarding that strategy is entirely justified. One other thing here: I suspect some part of the Pats’ gameplan against Cruz will involve being extremely physical with him at the line of scrimmage, probably with one of their outside linebackers. It would thus greatly behoove the Giants to frequently put Cruz in motion to help him get a free release. 2. The Giants should pretty much never have fewer than three wide receivers on the field. One of the many reasons why the Week 9 game isn’t particularly instructive is that, with Bradshaw and Nicks out of action, New York’s preferred formation of a shotgun, one-back, and three wides was rendered much, much less effective. Ramses Barden was the Giants’ third receiver that day, and he merited far less attention on the outside than Nicks will; this was one of the reasons New England could stick Arrington in the slot against Cruz that day. Aside from potentially exposing weaknesses in the Patriots secondary, the three-wide set should make it easier for the Giants to run the ball. How? By taking Brandon Spikes off the field. Spikes, the linebacker who returned from injury in Week 17, is one of the Pats’ best run stoppers. But he hasn’t been an every-down backer since his return, leaving the field in a lot of sub packages. The Giants already run fairly well out of the shotgun with Bradshaw. I expect to see a lot of that on Sunday. 3. What advantage does New England have defensively? Vince Wilfork in the middle. The weakness in the Giants line is the combo of left guard Kevin Boothe and center David Baas. Now if you’re going to have a weakness in the line, this isn’t necessarily a bad spot, since often the two can work in concert against a single defensive tackle. But the Patriots should be smart enough to be able to isolate Wilfork enough for him to wreak at least some havoc in the backfield. More than anyone else, Wilfork was the best player on the field in the AFC Championship, constantly interrupting Baltimore’s offense behind the line of scrimmage on both running and passing plays. If he has the same kind of impact he did in that game, it could short-circuit New York’s offense—much like the Niners did two weeks ago. 4. What can we expect from Rob Gronkowski? Who knows? If it’s actually a high ankle sprain—and yes, there are rumors the severity of the injury has been exaggerated—then Gronkowski is far from 100 percent. I know everyone heals differently, but nobody heals from a high ankle sprain in two weeks. Phil Simms recalled playing two weeks after suffering one, and called it “agony.” If Gronkowski can give the Patriots one good half—as Dwight Freeney did in Super Bowl XLIV for the Colts—I think they’d take it. 5. How does a limited Gronkowski affect what the Patriots can do offensively? It changes everything. As much as everyone talks about the duo of tight ends in New England, Gronkowski is way, way more important than Hernandez because Gronkowski can actually block. He performs both functions of the tight end really well, and that’s what gives the Pats all their formational flexibility. Note that when the two line up on the line of scrimmage together, Gronkowski is always inside Hernandez (unless he’s about to go in motion to the other side, at which point you can be fairly sure it’s a run to the side Gronkowski motions to). While everyone has wondered how the ankle sprain will affect Gronkowski’s abilities as a receiver, I’d be more concerned (if I wanted the Patriots to win) with how well he can block. If Gronkowski’s abilities as a blocker are compromised, then the Giants don’t have to honor him as a blocker as much and New England can’t be as creative with their formations. The same is true if Gronkowski struggles to get clean breaks off the line of scrimmage. Much like I expect the Patriots to do with Cruz, the Giants should make sure Gronkowski is punished often and early when he tries to get off the line. None of this section, by the way, is meant to disparage Hernandez, who is pretty versatile himself, evidenced by the fact he’s getting carries out of the backfield. I’d take him on my team in a heartbeat. But Gronkowski is much better. 6. How did we get all the way to No. 6 without mentioning the pass rush? The Giants will not rush the passer as effectively as they did in Super Bowl XLII. It’s an entirely unreasonable expectation for a bunch of reasons. New England is more familiar with the pass-rushing scheme, and more importantly, the Patriots’ offense doesn’t operate the same way now that it did then. In 2007, it was about Randy Moss and going deep. In 2011, it’s about getting the ball out quick on crossing patterns and letting the receivers do the work after the catch. The former is more devastating overall; the latter alleviates the pressure from a pass rush more. Let’s hop in H.G. Wells’ time machine and travel to a Monday night in Cleveland during the 2008 season. This was the point where the Giants were playing the best they have in the last two decades, and their pass rush had carried over the momentum from the previous season’s postseason run into a 5-0 start. And then New York got absolutely blown out by a Browns team that went 4-12. How did it happen? Cleveland took the Giants’ pass rush completely out of the game with cut blocks, short drops and quick passes. In 29 Anderson dropbacks, New York didn’t record a sack. The Browns threw for 310 yards on those 29 attempts (18 completions), and Braylon Edwards torched the Giants secondary for 154 of them on only five catches. If the Patriots effectively execute this gameplan—and we all know they have the personnel to do it—they can neutralize New York’s pass rush. 8. How well does Tom Brady play? REMATCH BOWL! —Rematch Bowl, my whole point here is that expecting Tom Brady to play well is normal, and that what happened two weeks ago has little to do with it. Brady is like a loaded coin that lands on Tails (he plays well) 90 percent of the time. The coin’s landing on Heads one flip earlier doesn’t change that. Do you really think the Giants aren’t going to be able to get a consistent rush on Brady? They haven’t gotten “consistent” pressure on opposing quarterbacks even in the playoffs. But you don’t need consistent pressure to take a team out of its rhythm. If the Giants do get some early hits on Brady, we’ll see more of the jumbo sets with an extra lineman, and we’ll see Brady start to get a little gun-shy in the pocket, releasing the ball a tic before he needs to. Those things add up. So what you’re saying is…I don’t know what you’re saying. Come to a conclusion! The Giants will get some pressure on Brady, but it will not be the defining factor in the game the way it was in Super Bowl XLII. New York’s biggest advantage in this game is with its wide receivers against New England’s secondary, as the Patriots have fewer ways to combat that mismatch than they do on the line of scrimmage. And you didn’t mention turnovers: Any turnovers in this game are going to be enormous, because they represent a stop for the defense. I didn’t mention them above, though, because I think the two teams are equally susceptible to giving it away and equally good at taking it away. I expect each team to get a single interception. That’s a ridiculous analysis. New England was +17 and New York +7 on the season: San Francisco was +28 before going -2 against the Giants. Yeah, anomalies happen. But they’re not likely. You can’t discredit an entire season of data based on an idiosyncratic expectation: We can’t discredit an entire season of data yet? Football Outsiders is kinda doing that. Why use the Giants’ home loss to Green Bay as a data point when their road win over the Packers is more recent? And the Giants are +5 and the Patriots -3 in the playoffs in turnover margin. Anything else to say on turnovers? I am ALWAYS skeptical of teams that thrive on turnover margin. That well runs dry eventually, if just for a game. Before the game against the Niners, Eli Manning said something to the extent of, “If we don’t turn the ball over, we win.” He was right. Whose legacy is this game more important to: Brady’s or Manning’s? Pretty obviously Manning’s. Brady’s spot as one of the best five to seven quarterbacks ever is secure. With a second Super Bowl title, Manning starts to garner eventual Hall of Fame consideration. Eight of the 10 QBs who have won multiple championships are in the Hall; only Jim Plunkett and Ben Roethlisberger aren’t. People will also start saying Eli is better than Peyton, but that’s because people are reactionary and generally unintelligent. But Brady could leap from that group of five to seven to one or two, right? He jumps in terms of titles, but I think it’d be tough for him to catch Montana—I put some stock in the fact Montana never lost a Super Bowl—and I can’t honestly say he’s definitively better than Elway or Marino. Never losing a Super Bowl? Come on, Montana played in an era of extreme conference imbalance. His Super Bowl was always the NFC Championship, where he lost twice: That’s a good point. That’s a really good point. What about the coaches? Kinda the same boat, right? Belichick’s already in the super-elite group, Coughlin can work his way into the elite group with a win. How do you, as a Giants fan, feel about this game? I’ve become more confident as the fortnight has gone on, just because so many of the matchups appear to favor them. For example, when you dive into how each team plans on defending guys in the slot, the emphasis seems to be on the Giants personnel and New England’s scheme. One’s faith in the Patriots’ ability to stop New York’s passing game derives almost entirely from the idea that Bill Belichick has to come up with something, right? But he hasn’t to this point. Time for those specific Super Bowl predictions: Giants get the ball first, since they take the ball and New England typically defers. New York gets off to a slow start and punts. The Patriots get two first downs and cross midfield before punting on a 4th-and-4. Al Michaels and Cris Collinsworth briefly discuss whether Belichick should have gone for it. The Giants get on the board first with a Lawrence Tynes field goal. Indeed, red zone execution will be a big topic of conversation after the game. New England gets a big play from Gronkowski to get down inside the 15, where Brady finds Welker on a crossing route for a TD and a 7-3 lead. New York responds with a 47-yard catch-and-run by Cruz to set up Manning to Manningham from 13 yards out on a sprint fade—the exact pattern used for a TD in the Week 9 game. REMATCH BOWL! Yadda yadda, the Giants take a 13-10 lead into the half. The Pats open the second half with Brady finding Hernandez from four yards out for a 17-13 lead. Tynes kicks a field goal on the ensuing possession to make it 17-16. Then the key possession happens, with Aaron Ross intercepting Brady and returning it inside the 10. Brandon Jacobs punches it in, and the Giants decide not to go for two yet. It’s 23-17. After a series of punts and Eli Manning’s lone interception (to Sterling Moore), the Pats go for it on a fourth down from the eight, with Brady hitting Welker for another touchdown and a 24-23 lead with six minutes to go. The Giants start a methodical drive to cross midfield before an out pattern to Cruz turns into a 41-yard TD. New York goes for two this time, but a fade to Nicks falls incomplete. Trailing by five, Brady gets the Patriots down to the Giants 40, but a key holding penalty puts New England behind the sticks. On a 4th-and-13, Brady’s pass for Hernandez is batted down at the line of scrimmage. The Giants run the ball twice into the line, then run a draw that finishes a yard shy of a first down with just under two minutes to play. Coughlin opts to punt. 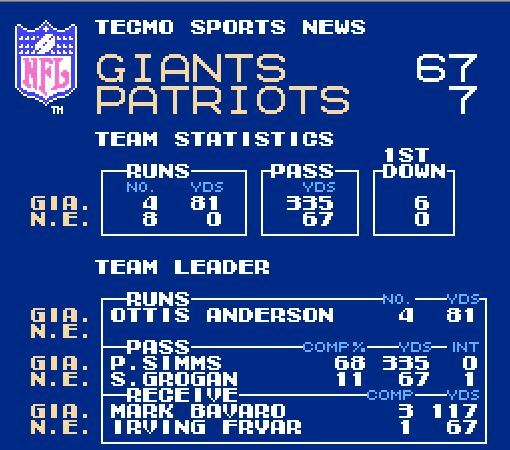 Brady again moves the ball with a series of short passes, but without timeouts, he is only able to get it to the Giants 25. On the final play from scrimmage, his pass for Gronkowski—held down throughout the second half—in traffic is batted down by Deon Grant. 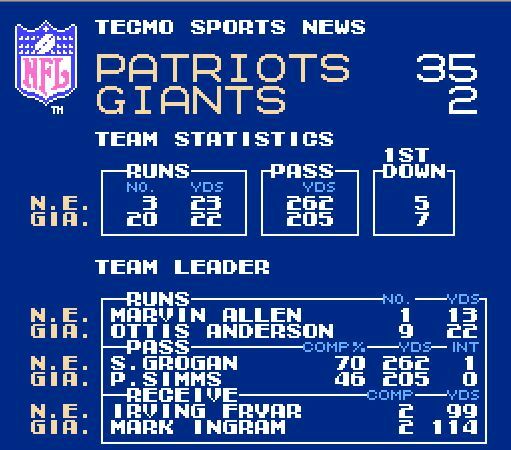 So: Giants 29, Patriots 24. 1) Roman numerals: While I agree with you that the Roman numerals have helped brand the Super Bowl, they have long since become more cumbersome than useful. The Roman numerals are a nice way to “historicize” the event when you’re dealing with Super Bowl I or X or XXV, but when you’re typing out Super Bowl XLVI, it becomes a bit ridiculous. It’s confusing to read, and who knows that the Roman numeral for 50 is L (and, assuredly, 95% of the people who do know only know because of the super bowl)? It’s nonsense, and it’s only going to get worse as the numbers increase. There’s a reason Roman numerals eventually lost out to Arabic numerals, and it’s not Western culture’s love of all things Arabic. Plus, it’s not like the Super Bowl’s cultural significance is precarious at this point. Is there anyone who would think “Well, I would have watched this game, but ever since they ditched the confusing and outdated numerical naming system, the game feels less important.” The Roman numerals may have helped make Packers-Chiefs seem more significant, but they have outlived their usefulness. 2) The distinction between Brady as one of Top 5 QBs of all-time vs. maybe #2 if he wins tonight is nonsense. Brady is the best QB of all-time, regardless of who wins tonight. Put it this way: Tom Brady is the best quarterback in the era of the best quarterbacks. Offenses are more complicated now, and passing is more integral than it’s ever been. Brady and Montana are eerily similar statistically, except that Brady has thrown more TDs and fewer INTs. You put excessive stock in the fact that Montana never lost a Super Bowl (even while acknowledging how conference imbalance makes that essentially irrelevant) while ignoring the fact that Brady’s playoff record is slightly better than Montana’s.